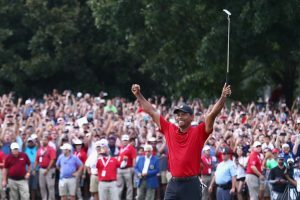 Despite a sunny Sunday afternoon, television turned out to be the biggest winner as viewers headed through the entrances to watch football, baseball, and Tiger Woods as homes using television (HUT) levels went through the roof. Big events certainly helped goose the numbers: in the Chicago area, you had the Crosstown Classic between the Chicago Cubs and Chicago White Sox; NFL action with the Bears taking on the Arizona Cardinals in Glendale, Ariz.; and Tiger Woods playing in the Tour Championship, himself a huge television draw. The Bears game airing on Fox-owned WFLD proved to be a huge winner locally, averaging a 23.7 Nielsen household rating according to the Chicago Tribune. The game went out to only 14 percent of the country, with everyone else getting Cowboys-Seahawks as the Bears eked out a 16-14 victory, though a lot of pundits assumed the Bears would make mincemeat out of the hapless Cardinals. With the win, the Bears are now in first place for the first time since 2014. The Bears easily outdrew the Cubs-White Sox game at Guaranteed Rate Field, despite airing on two channels with a 6.3 combined household rating. 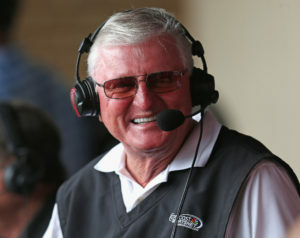 Chicago viewers clearly preferred the Cubs telecast on ABC 7 (WLS-TV) with a 4.7 rating, compared with the 1.6 rating on NBC Sports Chicago, which also featured the final broadcast of Ken “Hawk” Harrelson, ending his 33-year stint in the White Sox broadcast booth. The number for Hawk’s departure is disappointing – but not surprising on a number of fronts for the White Sox – especially after a poor season and the low ratings the team has averaged over the last decade. Harrelson’s reputation for making controversial comments – especially three weeks ago after the team honored him on “Hawk Day” – has a penchant for tuning off viewers. During the telecast, Harrelson waded into politics and said he doesn’t watch LeBron James play anymore because of his anti-Trump comments and said athletes should stay out of politics (note the irony.) It’s simply another reason why viewers didn’t bother to tune in. Tiger Woods’ 1st win in 5 years drew blockbuster ratings for NBC. Still, Harrelson gave a touching, tearful goodbye on-air yesterday as both White Sox and Cubs players honored him after the game ended. The keys to the broadcast booth now belong to Jason Benetti, who assumes those duties full-time as of Monday. But if there’s anyone who should be celebrated – as far as media people is concerned – is Tiger Woods. His comeback – where he won his first PGA Tour victory in five years – earned a 5.2 household national rating for NBC, peaking at a 7.2 in the 4:30-5 p.m. window. That’s up a whopping 206 percent from last year’s Tour Championship and despite tough competition from NFL games on CBS and Fox. Local ratings for the Tour Championship were not available (the Tribune didn’t bother to report them), but rest assured it did better than the White Sox’s NBC Sports Chicago telecast. National ratings released so far indicated the NFL saw metered-market increases Sunday compared to week three of the NFL season last year (though early games were down), proving once again sports is the major driver of the television business. If you put on the right type of programming people care about, viewership and homes-using-television (HUT) will increase as the biggest winner yesterday overall was over-the-air broadcast television in Chicago. And you can put that on the board.